This series of drawings from 2010 focuses on two sites in northern Brooklyn: The Domino Sugar Factory in Williamsburg, and an old industrial waterway called Newtown Creek in a part of East Williamsburg that is generally considered Bushwick. These drawings will be included in New Narratives, which takes a look at the empty and forgotten buildings of London, and imagines new uses for them. Opens Thursday March 8th, 2018, 6-9pm, at hARTslane Gallery, 17 Harts Lane, London. Here's the facebook page and the press release. The Domino sugar refinery is an iconic industrial site on the shore of the East River, near the foot of the Williamsburg Bridge. For nearly 150 years the Domino company processed sugar at this site, which at one point accounted for half the sugar consumed in the United States. The site has a powerful significance for the community. Generations of local people worked here, many of them with roots in the Caribbean. From there as well came the sugarcane by ship directly to the refinery. When the Domino complex finally ceased operations in 2004, the future of the site became a matter of contentious debate. 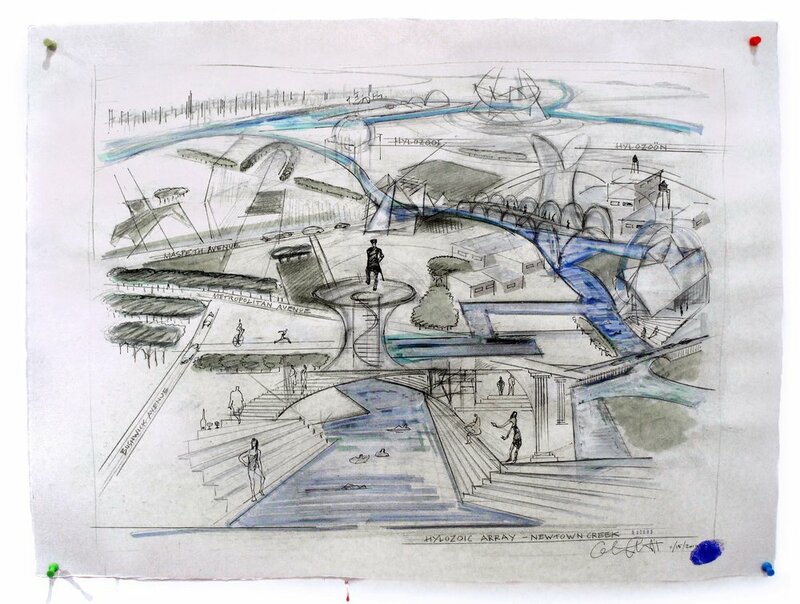 I was in a group that petitioned City Hall for a university at the site, as evidenced in these drawings. Another group called for a museum and cultural center along the lines of the Tate Modern in London with its repurposing of an old power station. And there was a strong push as well for subsidized housing. Today only the shell of the flagship building in the complex has been conserved, and the Domino property is under redevelopment as retail space, residential towers and parkland. Newtown Creek is a 3.5-mile (6-kilometer) long tributary of the East River. It is one of the most polluted industrial sites in the United States, with an estimated 30 million gallons of spilled petroleum, and raw sewage from the city’s sewer system. The surface of this meandering canal can sometimes appear limpid, but they say that just under the surface stands a deep stratum of “black mayonnaise.” In 2010, the year I made these drawings, the site was designated a major clean-up priority by the federal government. One especially dank tendril of this waterway has the aptly sardonic name of English Kills, and can be accessed by a metal footbridge. It was from that vantage point that I imagined swimming in the place — to be sure, in some impossible future, after some miraculous ecological cure. Others have also imagined, projected their wishes upon this degraded waterway, that it be anything but what it is. There is a “nature walk” along Newtown Creek for example, and a hazmat-suited kayaking club. And these of course are gestures, environmental public relations tinged with some irony. But they are effective gestures, they suggest a vision of what our post-industrial cities could become. Hylozoism is the notion that all matter is in some sense alive — air, fire, magnets, and so forth. It is the trope that inspires the title for these meditations on post-industrial Brooklyn. And it nods to the peculiar vitalism of a movement where art meets urbanism in Brooklyn over the past quarter century. In the early 1990s, there was unleashed upon Williamsburg an unrelenting cascade of illegal nightclubs, warehouse events, rituals and bacchanals that lasted for five years. In Bushwick in the mid-2000s, massive, incandescent, fire-breathing and mobile events would engulf many buildings in a single night, sending crowds on wild goose chases down alleyways and over rooftops, or boarding a rusty boat in Newtown Creek. Storied platoons such as Lalalandia, The Cat’s Head, The Federation of Ongolia, The Danger, The Junction, and legendary venues such as Galapagos, Rubulad, House of Yes and scores of other things, are the legacy of a social movement in Williamsburg and Bushwick whose cause célèbre is the fallow industrial environment, the place itself. It is a society that occupies the twilight zone between industry and an unprecedented urbanity that is still being imagined.